It is with great distress I write this. I consider you a friend and colleague, and you know I hold your food and beverage bona fides in the highest regard. You also know how much I love what you have done with The Cosmopolitan — turning it from an almost financial disaster to the most talked about hotel in town…and maybe the country. The murderer’s row of restaurants you and your team assembled on the third floor puts any aggregation of great eats to shame — save for the Time Warner Center in New York City. 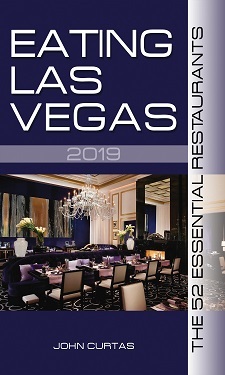 Foodies from far and wide have flocked there, the national food press has been effusive in its praise, and, most importantly, you have developed a strong following of locals who consider dining there one of the great amenities of living in Las Vegas. One of the small reasons people have been so excited about your food and beverage venues is because of the ease of ingress. The access that Costas Spiliadis, Scott Conant, and you, among others, bragged to me about a year ago when touting how easy it would be for locals to come, park in the convenient underground garage, and zip up to the third floor to bar hop, table hop, restaurant hop, nightclub or whatever. And how right you were. Your parking garage has been a breeze to navigate, a joy to park in, and within steps of an elevator to take you wherever you need to be in your fabulous hotel. That is, until a couple of weeks ago. To which I can only say: What is this, 1965? What are you trying to become, some kind of grind joint? How much does that traffic really mean to your bottom line, and what’s the sense in confusing and inconveniencing people who have made your restaurant floor so wildly popular? Obviously, someone (we’re guessing your VP of Gaming Operations) convinced you that making a few thousand (hundred?) hungry and thirsty people wind through the casino for an extra few minutes every night is crucial to improving your daily drop….but I would be shocked if the avid foodies, winos, babes, dudes and hipsters who are eager to eat and drink in your top flight venues are all that interested in being diverted to, or distracted by, games of chance. All you are doing is creating needless annoyance because your casino is jealous of all the traffic your restaurants are generating. More to the point: How many people actually use the parking garage to by-pass the casino floor just to eat? And are their numbers so vast that routing them around the casino will make a difference to your bottom line? This letter is being written to ask you to reconsider this seemingly small operational change in how your hotel operates. It was this easy access that was sold to locals. Many adopted it immediately and have been enthusiastic supporters of your hotel because of these not-so-little conveniences that demonstrated there was a sincere effort to cater to our needs. Tourists will always wander around aimlessly in hotels. That’s what they’re here to do. Give them the runaround and they don’t mind. The locals do mind and you’re going to lose them if you treat them like know-nothings who need to be herded around like sheep. The people who gamble gamble. People who want to eat and drink eat and drink. In your hotel, I’d venture to say the confluence of the two groups less likely than in any other — mainly because your third floor has become a legitimate attraction in its own right. Someone other than a restaurant critic should have told you this. Someone other than me has to have noticed that the accessibility of all of your tasty attractions is part of their appeal. Someone needs to be accountable for damaging your brand — a brand I know you and others have worked mightily and successfully to establish. Someone needs to be (figuratively) shot. I agree (although I usually just valet park at EVERY Vegas hotel, simply to avoid hassles like this). Cosmopolitan has a wonderful food selection, and F&B is their top revenue earner. The casino is is third place out of three, so theoretically this “makes sense”. Route guests through the casino on their way to your restaurants means they are more likely to gamble on their way out of the hotel. Unfortunately, it creates a hassle for guests who don’t like/want to gamble, like most of us locals. Until this is fixed (or if it is never fixed), just stick to valet. Sure it may cost you a $2-5 tip for the driver, but it’s worth it to avoid this mess. Using the valet doesn’t eliminate that slow slalom through the casino to get to the restaurants. Should be interesting to see the type of response you get. As a non-local, I’m not self parking too often. But every now and then, some in the group has a car and we drive. I know you don’t want us as we’re less than gorgeous, but we 70 year olds just love to hike endlessly through a casino just to get to a restaurant we want to try. Now my friend will find those slots and stay on them while I go eat. So do you really want to annoy us? Convenient access is a major determinant for where we go. Oh….yeah…forgot to mention my neighbor. His gambling budget is around $50,000 a year. But he likes to eat too. Yeah, we’re old…..and we have money…but hiking is not our strong point. Agreed, Mr. Curtas. It is unfortunate that they have to rely on crap like this for their bottom line. 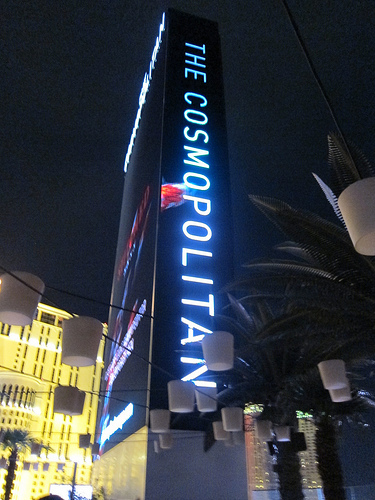 Things are tight at the Cosmo, evidently- but the restaurants must be doing well? It is also quite possible that they are doing this for additional Marquee visitor money- people with far more disposable income than we do (after the crash). It is, after all, not always about us and other crazy seersucker wearers. What this suggests is that perhaps you really can’t get away from the old Vegas design without paying the price. And this isn’t a grind joint. You know that. The floor design was an inherited problem, unfortunately. The biggest problem with that floor is still traffic flow- and the road isn’t really inviting to wander from visually. There are bottlenecks, for example. The problems are due to the initial design of the place and are really difficult to solve. Either side of the floor flow is anchored by bars (due to entrances) and there is a giant bar in the center that is a destination point and hub but impedes flow at great expense. Geometry and common sense would suggest something destination wise equidistant. I know a great retail store that could help with that problem. Well if that isn’t just the oddest thing! So much effort to put into complaining about a scenic walk. If that isn’t typical lazy American behavior, I don’t know what is. It took you longer to write that letter then it would take you to get to the 3rd floor from the elevator. It’s not like you have to climb a mountain! Sheesh. I’m with the guy that says a stroll before and after eating can actually be a positive activity. Unless you are all drunk and falling into the slot machines and bumping into people. Then I can understand the need for easy access to what is hopefully a car that someone else is driving. ELV responds to @Donna: And the point is missed entirely. Once the hotel decided to make it convenient to shoot to the 3rd floor, they picked their poison. Now they are backtrakking and are getting called out for it. They should have let it be as it was. If they restore that elevator service, you may want to do the Cosmo a favor and post it here. I won’t know for myself since I won’t be going there anymore. Opps John-no more comps for U at Cosmo. If they don’t improve the gambling revenue there won’t be a hotel w/restaurants we love to visit. Give the Cosmo a break and let them do what they have to do to stay in business and don’t be too selfish! Why don’t you be selfish and keep your smoke to yourself. I admit to being selfish by spending too much time and money at Milos, Scarpetta, Comme Ca and Jaleo. I will spread myself out more at Sage, at Sensi, at Bouchon, and many other great places on the strip. Where in my post did I say I smoke? For your info I don’t smoke. It seems to me you have a chip on your shoulder. The Cosmo is in business to make money, if it doesn’t sooner or later they will have to file bankruptcy or sell to one of the other casino conglomerates in town. And then the future of the restaurants we all love could be in doubt, that was the point of my earlier post. Sans a few intellectuals who have entered this discussion, the rest of you are missing the point of the arguments that ELV eloquently laid out. Oh come on people. Let me paint a picture. Weekday night. Spouse and kid in tow. Need to eat. Then the “where should we eat” bomb gets dropped. After jousting for an hour with that one you realize time is now an issue. And when you finally compromise that house made shumai at China Plablano will do it because we can just sneak up the east elevator…wham, the issue! And my business goes to Spring Mtn. Convience, not laziness forged local loyalty there. Thanks John for fighting the fight. This is the same logic as to why the food court is in the center of the mall as so people can walk, shop, spend money and get hungry and eat at the food court. The obvious quesion is, why it took so long to close the direct access? By closing the access and giving a detour has reflected in increased casino earnings? Ultimately, has the restaurants suffered from the lack of direct acess? For people who don’t mind walking but don’t like the noisy casino, either valet park or park by the WEST elevators (the first ones you encounter as you go downstairs). Go up the escalator next to the Vesper Bar just off the check-in. You can go to the third floor that way and have a nice quiet walk down their meeting room hall to the restaurant area, and enjoy some very nice art along the way. Keep up the good fight John, as eloquently as the fight deserves. 1965, eh? Were you in Vegas in 65? My memories of 60s Vegas are of food so bad I wish I’d forgotten it and slot machines next to the urinals. Thankfully, things have improved. My friend Pat Flanagan has a good point, and it’s a route I often follow from either self park or valet. I’m usually at the Third Floor within about 3 swift minutes. Also, Cosmopolitan continues to have one of the easiest ingresses from the Strip of ANY casino. But let’s remember, it’s a CASINO resort. That third floor does not exist without the casino under it. In fact, every fine dining restaurant in the whole county does not exist without the casinos. Come to think of it, is there even a county at all without the slot machines? Look at the bright side, John: Mr. Unwin has assisted your efforts in driving locals to the stronger off-Strip restaurants! Verified this tonight at the Cosmo. On the east elevators they taped a cheap sign over top of what once was access buttons to 2nd & 3rd floors. We wondered if we pulled back the sign would the buttons for 2nd & 3rd floors still work? ELV responds: Great comments all….well, mostly all…and @EC Gladstone makes a good point. Unfortunately, there are only a dozen or so off-Strip restaurants in town worth visiting on a regular basis. What cheeses us off is the consistent hypocrisy of the big hotels — who give lip service to catering to “locals” (especially when their business is down) and then pull stunts like this — a stunt that’s really a “f* you” to locals. We haven’t tried simply walking across the hall as you exit on the first floor to the other set of elevators, which go up to the next two levels….but if that’s true, we’ll let our readers know and challenge the numb nuts at Cosmo to find another way to crap on the restaurants and their customers. John, you have a perception problem. These are not hotels with casinos attached. They are casinos with hotels and restaurants attached. If the casino wasn’t there, nothing else would be. So the needs of the casino come first. That’s why the marketing efforts for most of the restaurants are hamstrung, everything has to be filtered through casino marketing to ensure that it benefits casino first. OMG! You have to walk 3 minutes to get to a restaurant in a casino? Ever been to Bouchon? The horror!